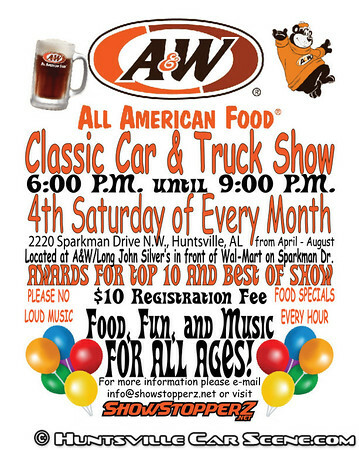 The tradition of the A&W car show continues into 2011! Everything is the same as last year. This show will be held on the 4th Saturday of each month from April until August and the times will be from 6:00pm until 9:00pm. Food specials will be going on all during the show. For any more information please e-mail info@showstopperz.net or go to www.showstopperz.net. I got to get out this weekend!! I haven't had time to get the '39 out much this year, this might be a good opportunity. Absolutely! Look forward to seeing you there! Had a great time, met some new friends, the weather was great & there were some beautiful cars there. Last edited by HOSS429; April 24th at 09:48 AM. That A&W closed down years ago. I don't think so. I don't think there's even an A&W there anymore. But it's interesting to hear how some things have never changed. It's always the newer cars, and the youth that are getting shunned at cruise-ins. Great insight from someone that's 'young'. I saw a Chevy Volt in Huntsville this weekend. The revolution has begun. I saw some impressive Honda's, some new Camaros & Mustangs, I am sure they could give my 276 cubic inch flathead a decent race. Of course with a little head start. I could use the Volt for a jump. Bump for the month of May. Who's thinking of coming or coming? I'm about 90% coming. Be sure to mark yourself as attending. That's why I made that feature. I'm 86.458% sure I'll atleast swing by. Are you sure you got enough decimal places? lol. When I was in college in Florida, a guy with one of the best short memories in the world came for a presentation. He had pi memorized to 100,000 decimal places. He joked about never forgetting a girl's number and how it was a great pick-up line, lol.